Last week in May (2016) an [article] was published describing a new marine reptile that lived during the Mesozoic, specifically during the Middle Triassic (274-242 millions of years ago). Even though we had known about this animal from previous studies, this new study described the shape of the skull based on 2 new fossils found in Yunnan, China. Figure 1 from the paper showing the two new fossils. This animal is called Atopodentatus unicus (Atopo means ‘strange’, dentatus means ‘tooth’ and unicus means ‘unique’). The name comes from its crazy shaped skull. The bones that make up the front of the snout (maxilla and premaxilla) are shaped into a ‘T’ like a hammerhead! All of the teeth in the front of the snout are small and shaped like pegs. The teeth in the back of the mouth are normal, so this animal has 2 completely perpendicular (meeting at a right angle) sets of teeth. Figure 2 from the paper showing the bones in each of the new fossils. “m” is maxilla and “pm” is premaxilla. Before these fossils were found, paleontologists thought the front of the face was turned downwards. These fossils give us a much clearer idea of what their faces looked like. What were they doing with their hammerheads? Probably scraping aquatic plants and algae off of rocks, meaning this marine reptile was an herbivore. They may have even fed like baleen whales do: taking in a lot of water with their food and pushing the water through their teeth to filter the water out and keep the food in. 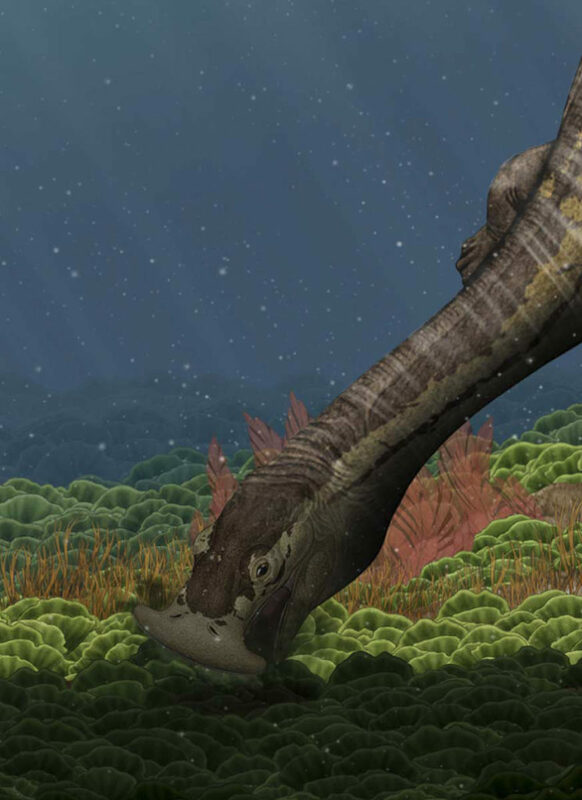 Because it lived in the Middle Triassic, Atopodentatus was the earliest marine reptile that was an herbivore that we’ve found! Figure 3 from the paper showing Atopodentatus eating. Drawn by Y. Chen.